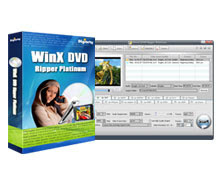 WinX DVD Ripper Platinum is a product from WinxDVD, it can help you to rip and convert DVD video into your computer. The retail price is $24.95 US dollars, even on special sell price is $19.95, but now we can download it for free. It is very easy to get it, even you do not have to register, just click "Free Download" button on this page. This is full features application, it is totally free available from September 15 to October 31. This special version for Techweenies readers but actually for all users.